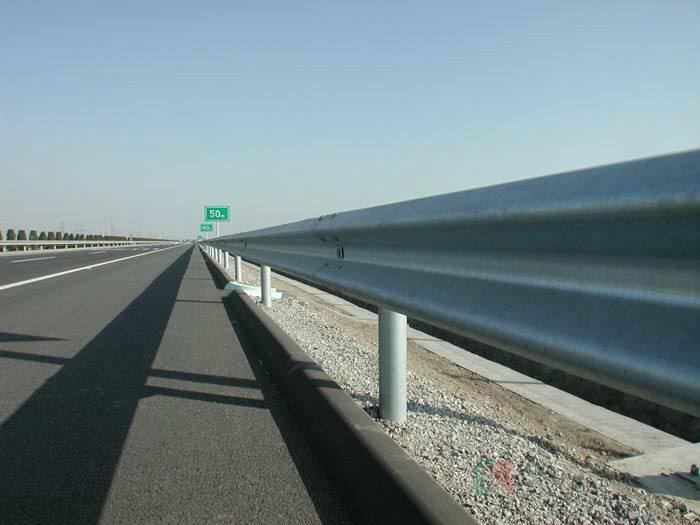 Highway Guardrail roll forming machine - Buy Product on ZhangYun Machinery Manufacturing Co.,Ltd. With two tapered electric bulgy clamps, and its carrying capacity is 8 tons. The inner diameter of the roll material is about 500 to 600mm, the maximum diameter of steel coil is 1800mm. Clamp motor power is 2.2kw with 4-pole normal motor. Adopt ZQ250 speed reducer, its speed ratio is 31:5. 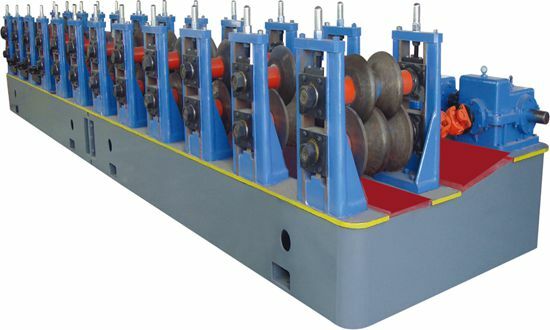 Wallboard seven-roller leveler with two-roll pinch and five-roll leveling. Leveling roller diameter is 110mm. The leveling machine before and after has vertical guide roll. Feed inlet port equipped with nip rolls. material: 40Cr, quenched hardness: HRC48°~52°, motor power:7.5kw, 6-pole normal motor, ZQ350speed reducer, speed ratio: 20:49, φ200 arrester brake. Adopt YL32-315 four-column hydraulic punching machine, and hydraulic station motor power is 22kw. 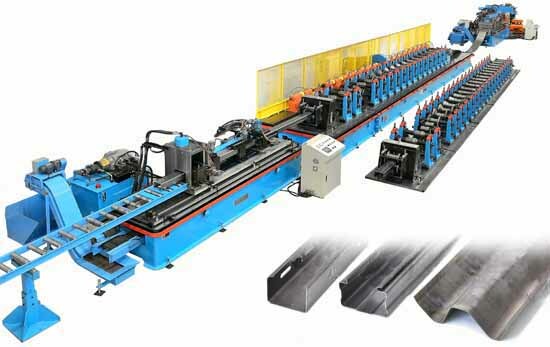 One set of two waves guardrail plates punching cutting die, design and process mainly according to users’ design drawings. The material of mold inserts and plunger chip is Cr12MoV alloy steel. The punching machine before and after equipped with adjustable guide roll. (guide roll material: Cr12MoV, hardness: HRC58º～60º) Besides, it also equipped with a set of spare blade and plunger chip. It has two pairs of feeders and requires two becomes one. This unit includes 11 molding processes with independent open arch structure. 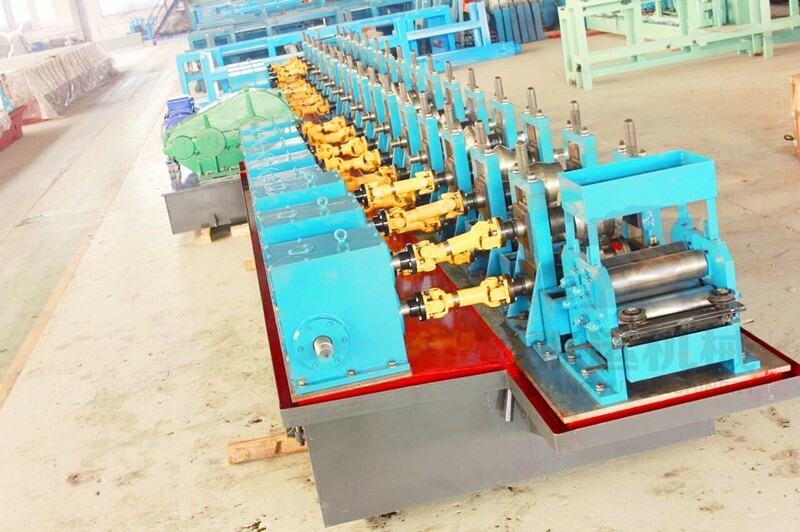 The mechanical spreading width : 550mm. 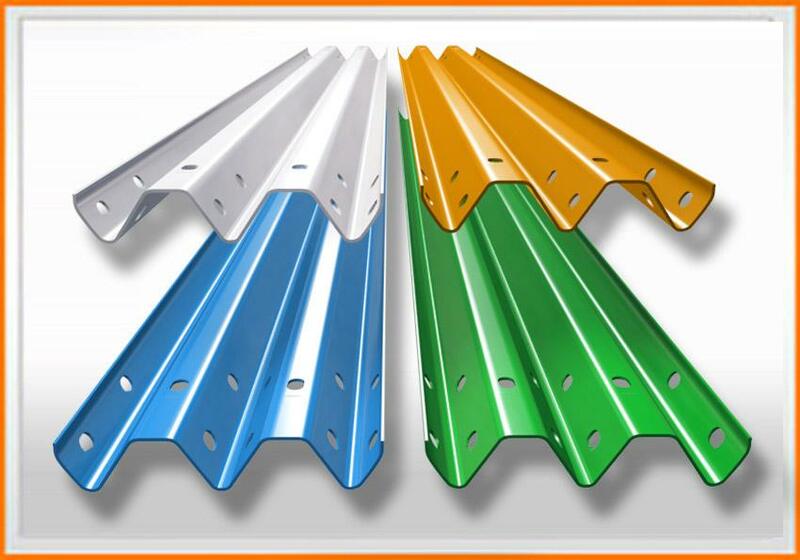 Arch material : HT200 , tempered. Material: 40Cr steel, quenched and tempered. Bearing type: Fixed surface 7216, regulation 32216, each has 4. 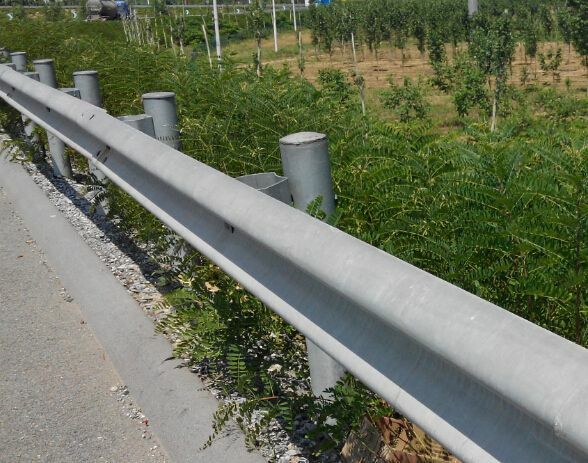 Use 1 inch double chain drive between the transmission gear box ; universal transmission shaft between the roller shafts, and the universal transmission shaft type is140-275. Use 1.5 inch dual chain drive between the speed reducer. 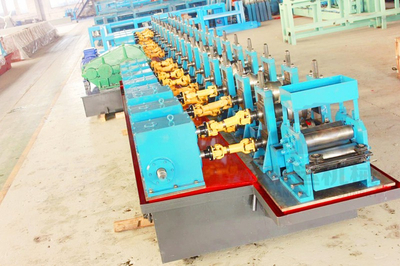 A set of two wave guardrail plate roll forming die, designed and processed according to the national standard. The material is GCr15, and the overall quenching hardness is HRC58°~ 62°. Roller type material receiving station, 5m length, 6# steel welded. Common control system. Can manually and automatically control the harmony of various parts of of the whole production line. The equipment total power is 78.9Kw, with 30000mm * 4000mm length * width. The maximum rolling height is 85mm, the maximum rolling thickness is 4.0mm, and the maximum rolling speed is 3 ~ 12m/min. 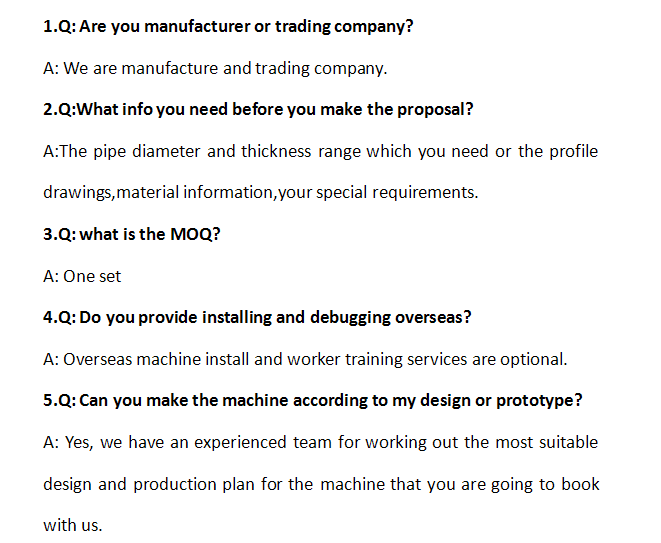 Structural materials of welding machine seat must meet the requirements, welding must be up to the national standard . Equipment after rust cleaning should be firstly coated with steel special anti-rust paint comprehensively covering, and then coated with high quality topcoat. The rotating part should be divided by warning color.